Want to educate yourself? Read the bevy of well-sourced solid articles on HoneyColony! Looking for Phyto-rich Hemp Oil? 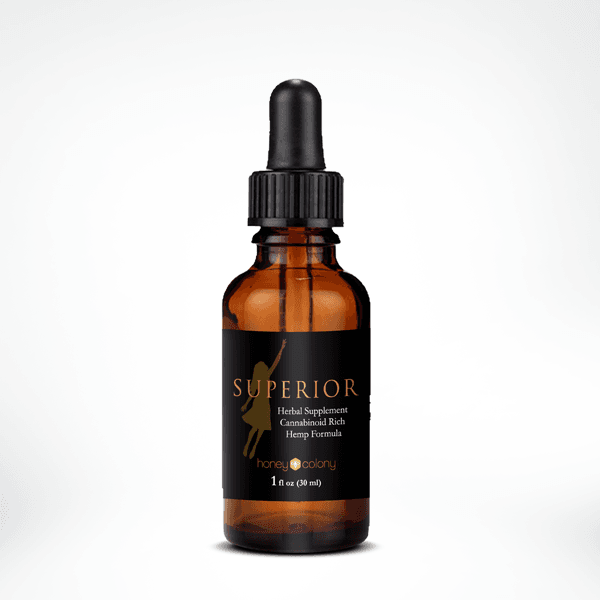 Introducing Superior – a custom-made fresh formulated optimized Hemp Oil. One customer calls it the ‘Lamborghini of hemp oils! 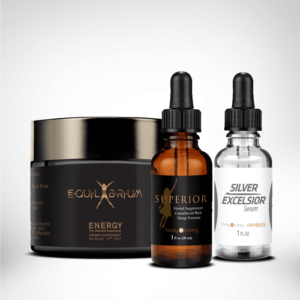 Superior is the result of a collaborative effort to develop a novel, nanoparticle liposomal 10x bio-availability optimized hemp oil extract using exclusively natural, plant-based ingredients in a complete botanical formulation. A 3-pack is available here. Keep in mind that some of the liposomes formulas out there use a phospholipid matrix that includes synthetic agents. Since these are embodied in the matrix they are not included in the ingredients list. Also, most water-soluble systems include a surfactant to maintain a solution – this is almost always propylene glycol- it is not a required listed ingredient since it is considered a “processing aid.” We do not bury any synthetic materials in our product. Superior hemp oil nourishes the body’s endocannabinoid system (ECS), a group of endogenous cannabinoid receptors located in the brain and throughout the central and peripheral nervous systems. A decrease in the functioning of the ECS can lead to chemical imbalances throughout the whole body. Our hemp oil acts on the ECS to increase its function and promote total body health. In addition to faster liposomal absorption, our special formulation synergizes hemp oil with other medicinal herbs used in ancient medicine. This is a potent concentration inside of a small travel size bottle. Superior proportionately offers 4 or more parts CBD to 1 part TCH, for maximum relief and minimal or no storage issues. No other product in the marketplace uses this finely extracted, optimized cannabinoid matrix, using production that meet high-end specifications, using only natural ingredients in its processing. Integrity is key. Canadian Customers: Please review our FAQ before purchasing as your order may not pass through customs. Western medicine likes to synthesize and compartmentalize compounds. But the phyto-nutrients contained in whole plants are complex and complete. While identifying active principles is a useful research tool, evidence supports the superior therapeutic value of the naturally-occurring synergistic chemistry of the whole plant. In other words, whole plants or mixtures of plants are more effective than isolated compounds. It’s about treating your health as a whole. With the assistance of HERBOLOGIE’s master formulator and a veritable alchemical magician, we have actively mixed, tested, and finally formulating a recipe that looks to traditional medicine such as the ancient Chinese and the bees Superior Hemp Oil‘s profile aims to enhance, regulate and support a long healthy life. The dang shen root is a traditional Qi tonic and is notorious for offering the numerous therapeutic benefits ginseng offers. It is widely known for its energy, mood enhancing, and restorative support. When combined with astragalus, dang shen root is called The King of Combinations. supporter of healthy blood sugar levels. In Chinese, Huangi Qi translates to Yellow Leader. This is due the yellow color of the root and it also being considered the leader of tonic herbs in traditional chinese medicine. In Greek, the name translates to Defense of the City, referencing its use in maintaining the integrity of the hive. Propolis is used by bees to repair and protect their hive. Typically, propolis is comprised of resin (50%), which is composed of flavonoids and related phenolic acids, generally called as the polyphenolic fraction, waxes (30%), essential oil (10%), pollen (5%), and other organic compounds (5%). However, this chemical composition may change according to the plant source and season; hence, quality sourcing of propolis is important. Bitter orange is grown in various varieties throughout the country. The citrus aurantium variation is native to southern Vietnam. Please Note: Superior CBD contains alcohol. Now shipping to all 50 states! Suggested Use: 4 drops x3 daily, for a total of 1ml; apply under the tongue and wait 90 seconds, then swallow. Superior uses reduced-particle hemp concentrate for direct delivery to the bloodstream through the mucous membranes under the tongue or inside the cheek, avoiding the problems that occur with drug interactions and degradation of the the oil in the liver. We also achieve higher blood serum concentration of hemp oil with less material, by using the much more sophisticated system of encapsulating whole plant hemp extract in liposomes in a water suspension. Please be advised: Superior CBD contains alcohol. Pregnant and lactating women, please consult your physician before use. What is the carrier oil in Superior Hemp Oil? We do not use a carrier oil. The hemp oil is a 40% concentrate cleaned of extracellular debris. When consumed orally, via digestion, cannabinoids are subject to 85-95% first pass degradation. That means that only 5-15% of the hemp oil enters systemic circulation. Sublingual application is the superior means of delivering hemp oil. Most products in the market simply add their rich hemp oil to coconut oil, often calling it a tincture (it’s not a tincture.) The problem in that case is that the hemp, which is an oil, is now swimming in a pool of oil, and the hemp oil simply isn’t able to reach the oil-friendly receptors and achieve significant bio-availability. It’s oil competing with oil (hemp oil is a very potent oil, so there’s a tiny bit of it) and it cannot compete with the volume of coconut oil. Instead, our rich hemp Superior Hemp Oil is water soluble and liposomal encapsulated. Liposomal encapsulation ensures the cannabinoiods can diffuse into the body for highly absorbed, more effective health benefits, while also increasing their uptake and transport. Superior has very small particles that are readily absorbed, and further facilitate permeation into the bloodstream with the use of naturally-occurring saponins. Research shows our delivery system to be 99 percent bio-available when taken properly; i.e. allowed to sit under the tongue for approximately 90 seconds before swallowing. Superior is carried in a botanical glycerite (naturally preserved botanicals in water and non-GMO vegetable glycerin). We offer a fully formulated product, based upon both science and traditional use. The botanicals in our formula are valuable in and of themselves, and, energetically speaking, necessary to offer a balanced formula. Are there any steps to preserve or replace lost terpenes? There are currently no terpenes in the original hemp concentrate. Hemp contains few terpenes, which are present in certain hemp strains bred for high TCH, It is not legal to extract these terpenes for use in any products other than those regulated for seed-to-sale in legal states. Our partner company is currently working on the formulation of a hemp oil formula including naturally occurring terpenes. Stay tuned. Does Superior have a shelf life and/or do they require refrigeration? Superior does not require refrigeration. It is formulated to be naturally preserved, though a shelf life must be claimed. Glycerites are easily shelf stable for 2-3 years. Superior is manufactured according to FDA/ DSHEA standards in a cGMP compliant lab. Unfortunately, it is possible for hemp oil to result in a positive — much like eating a poppy seed bagel can cause a positive for opiates depending on the type of test. The hemp oil used to make our products contain .3% TCH, the federal limit of .3% allowed. You should use discretion if planning to be tested. *The FDA has not evaluated the validity or truthfulness of these claims; therefore, we encourage you to review published researches relating to the benefits and properties of hemp oils and other hemp oil products. Many customers have asked us if the hemp oil we are selling is legal to buy in their state or country. Well we have some good news. Due to the hemp oil used to make Superior containing 0.3% TCH, the legal amount of TCH and only the potent health support without the psychoactive effects, if you live in any of the countries listed in the “Additional Information” tab, we are now shipping hemp oil. Our legal 0.3% of TCH is also enough to cause the “ENTOURAGE EFFECT,” which promotes it’s health benefits. PLEASE BE AWARE: As buyer, you are responsible for any customs fees or regulations for your country or territory. HoneyColony’s mission rests on evolving, upgrading, and offering impeccable quality products to promote longevity and wellness in life. Quality products and professionals that I trust. I will never be without my Superior. It has completely changed my life for the better. It really works for life long headaches. When you were having trouble getting product we tried CBD from other sources and it did nothing. It has changed my life, I am pain free at last! Thank you and may God bless you. This has helped me tremendously. I have told my friends and relatives to get some of their own! Absolutely cannot live without this. My husband and I take it daily. I will never be without this product. Changed my life. Definitely high quality! A definite plus to ease my aches and pains. I highly recommend it! Thank you so much for making this product. It has changed my life. NO MORE ALTITUDE SICKNESS while in Colorado AND GREAT SLEEP since on Superior CBD OIL. So far I absolutely love this oil. I have suffered for more years than I care to even think about with joint pain. I have done everything from Acupuncture, chiropractic, multiple surgeries, over the counter meds, prescribed meds, pain management therapy. To some degree all have had some positive results, but nothing and I mean nothing have allowed me a good night sleep with out either Waking myself up from whimpering in pain or just so uncomfortable that sleep is not an option, and just after two days Of taking this oil at 3 drops 3 times a day I have sleeped over 6 1/2 hours a night. Which is unheard off for me. Just that alone makes my day time pain so much more Tolerable. II have been on Prescribed meds for inflammation in both my knees since May. Trying to buy sometime for both knee‚Äôs to be replaced, I‚Äôm 55. My physician would like me to wait as long as possible. Thinks I‚Äôm too young. But I never got the results that I got from this oil so Quickly. Haven‚Äôt been able to bend my left knee for about five months now until I started taking this oil. I‚Äôm a believer!!!!!! I have seen a huge difference in my restless leg that now that I have run out of the Superior Oil it lets me know that this is a great product. I can’t wait to make my next purchase. I also plan on trying the probiotics and Hydra! Take it nightly and helps me sleep and my next order I’m hoping you have different flavors. I can tell a huge difference when I don’t use Superior before going to work. My social anxiety holds me back from normal conversations and standing up for what I believe in. When I take this I am more confident in myself and my ability to speak to others. My entire family is now using it for different reasons. My mom for pain, my grandma for Parkinson’s, my sister for OCD. It’s life-changing. This product is the reason why I am still here. I swear by it and will never be without it. I just started taking this product and I seem to be sleeping much more peacefully. I’m able to get at least 6 hours of uninterrupted sleep which hasn’t happened in years since I worked nights/days with a crazy schedule. I was waking up 4-5 times a night, waking up really tired. I seem to be getting better everyday. I also got this product specifically for my younger brother who has suffered terribly with JDB after the dentist ruined his mouth after pulling wisdom tooth under anesthesia. There was nothing you could do to alleviate some pain but this seems to be magic. Thank you so much Honey Colony for caring about the human race. Seems to be working on my minor aches and pains in my fingers. Strong taste in the mouth, but helps my mom relax. Packaged well and arrived quickly. Hemp oil is the best l have used. Well I know it’s high quality so I’m glad about that however it tastes like an old Avon perfume from years ago lol, wish it could taste more like coffee since it looks like coffee. I was suffering with gut,skin,athritic and sleeping problems and within the first week experienced massive results. After one month I had relieved pretty much all my problems by at least 70%. Sleeping like a log these days. Amazing product,which also after my Mum had a nervous breakdown I convinced her to stop her medication and and try CBD….within the first few weeks she had improved and after 6 weeks was back to her old self and feeling on top of the world. Can’t rate this product highly enough….keep up the good work. I’m thrilled with my results from taking Superior CBD oil. I have a lot of inflammation in my body and have been taking 800 mg of Motrin for years and I’m so happy that I don’t have to take it anymore. I’ve only been using it for less than a week so I’m looking forward to getting even better results in the future!!! Works really well for balancing the nervous system! This product clarifies my mind and gives me energy! It’s fabulous! 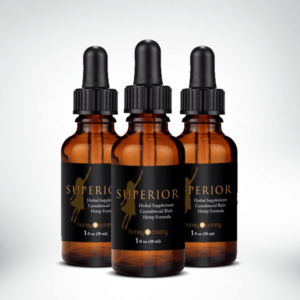 Superior CBD Oil 3-Pack. I’m really noticing a difference after taking it. I couldn’t drink anything with caffeine in it because I’d feel overstimulated later. Now I can drink a couple cups of black tea without negative effects. The balancing of the nervous system is key for me and I can tell it’s bringing out the parasympathetic and toning down the sympathetic. It helps me sleep at night. Using this to help keep my cancer away. So far, so good. I‚Äôm so grateful for this product. I purchased Superior because I am not a fan of narcotics and I was set to have an abdominal myomectomy. I was in need of something to lower my stress, help with pain, and aid in sleep so that I could heal properly. I am happy with my purchase and love the formula. I was deal full of a bad taste, but the orange essence is perfect. I have recommended this product to everyone and I will definitely be a return customer. This product works, I sleep much better and it has reduced inflammation due to Cohn’s disease significantly. Love this product, great results! I would highly recommend! Helps me relax and helps my immune system. Helps hubby sleep through the night and lessens muscle pains after only one week of usage. Can’t wait to see the improvements after a whole month! I ordered a 3-pack of Superior CBD and want to inform you of my results. I’ve struggled with anxiety, hypertension, and edema (swelling) for years, partly due to my DNA (me N A) but also due to multiple year-long combat deployments from my military days. The first time I took a couple sub-lingual drops, I noticed within several minutes that I felt more at ease and less prone to being agitated by my kiddos, noise, or other stress triggers. I don’t dose daily because I forget often but am going to start because I believe there is so much goodness in overall health that comes from CBD including cancer protection and overall wellness, not to mention a better family atmosphere. Recently I forgot to take my CBD a few consecutive days and it resulted in arguments, stress, higher blood pressure and more awareness of my PTSD. I make it a ritual to take my CBD now and am thankful for feeling normal again. I have additional ailments that I’ll report on later to see what kind of effect it has on them. I have taken up to about 5 drops (or a squirt) in the morning and a few at night, might be excessive but I use it anytime I start to feel anxious and it always helps. Thank you for fighting to keep such a wonderful product available! After years of struggling with osteoarthritis in my feet and knees along with tinnitus which caused me sleeping problems,within two weeks of taking this product my pain is pretty much gone and can move so much more freely. Only bought it for joint pain but has reduced my tinnitus also and sleeping sound at night now.TOP TOP product. Wow! We’ve tried several other oils all with this promise or that promise. None of them had the others gave us the feeling of calmness and soothing nights sleep that the aptly named Superior oils. We would highly recommend these to anyone looking to try or switch from their current brand of oil. My daughter gave me a bottle of Superior hemp oil to see if it would help the pain and stiffness in my hands. It took a few weeks, and was subtle at first, but the pain and stiffness is now gone and I can make a strong fist with both hands. The most surprising benefit, however, was when my blood sugar readings started showing within normal range. My doctor thought perhaps my meter was not working correctly, I had the meter checked and it is working fine. Although I am still on some insulin, it is much less. What a wonderful product. I will not. be without it. First time trying hemp oil, after researching extensively, I came to Superior . I cannot say enough of this great oil; it relaxes me when I am anxious/stress; I get the BEST night sleep w/out waking up 3-4x’s/night. Has helped my IBD from flare-ups. Also, helps with joint pain. Love the taste. Highly recommend this amazing cannabinoid oil. Thank you. I first started taking this last fall and noticed within a few weeks that I felt calmer and more relaxed and started sleeping better which was so great since my sleep had been poor. I am in perimenopause and have had some anxiety that it was really starting to affect my quality of life. Unfortunately , I ran out in January and was only able to receive more a couple of weeks ago. I am now starting to feel the positive effects again and I am very grateful because this helps keep me calm and balanced. Thanks so much for offering this product! I have been researching nutritional hemp and wanting to use it in place of the Xanax and Klonopin I have been taking for years for severe anxiety, the side effects from these products were not worth it to me anymore. I tried the extract in the morning first thing and again in the afternoon, and by early evening I had noticed a significant difference. I felt calmer, those rapid thoughts decreased and my sleep improved, I dreaded the nights. I’ve been using Superior for 5 days now, and my mood has improved, my anxiety has decreased significantly, and going to bed is no longer dreaded, I look forward to it. This was a great decision … to treat my anxiety. I even feel better just for making a more healthy, holistic choice! Like many men I avoid doctors and discussing my health. Poisons: If you don‚Äôt know how these affect you, google it for the unpleasant details. Parasites from dirty water, sloppy cooks, and poorly maintained pets. Tropical fevers/diseases from traveling in 3rd world countries. Rat Poison from criminals who were paranoid that I‚Äôd discovered their plans. If you haven‚Äôt passed out from vomiting blood so hard that your stomach gets wedged into your throat and you can‚Äôt breathe then you probably don‚Äôt know how much you actually want to live. I‚Äôve made promises to God that would take several lifetimes to fulfill. This extract has improved my digestion which never recovered from the multiple incidence of poisonings. It also increased my lucid dreaming and improved my sleep. I’ve been struggling with insomnia and brain fog since I had a hysterectomy some years ago. I haven’t enjoyed who I’ve become. I generally tend toward irritability, with pangs of sadness. This product has helped tremendously. I take it periodically during the day, just 3-4 drops under my tongue, wait till I swallow, just like it says. I double the bedtime dose about 10-15 minutes before I want to sleep. The most dramatic improvement is that I now sleep again. Like a normal person. I would say it was about two weeks into taking it that I realized I’m no longer dreading going to bed. The brain fog is better. I can find words again. I still have some irritability, some blues, but it’s much better. It’s the difference between seeing endless sad days ahead and wondering how I’ll ever manage, and have a tough day and knowing it will lift. Hormone replacement, melatonin, diet and exercise, all good for me, but none of it worked. For women with hormone and mood issues, definitely highly recommended. I am noticing too many great things and really don’t know where to start. Well my gastritis is gone, in 2 days, my skin and hair OMG are amazing. Everything about my health is improving, even some scars are gone. I don’t know how this works but I love it. The shipment was very quick and I love the taste. Sometimes I take a spoonful without mixing it into any food and it is very tasty. It is lighter than most oils in your cabinet. I am already feeling the benefits and it has helped regulate my system and kept my energy levels up. Thanks again for a great product and great service. My family has been utilising this product for about a few days now. Since then, I never feel short of energy even while watching boring replays of baseball matches. This oil has proved quite effective in nourishing my body‚Äôs health ever since I started using it. I like the fact that it is made exclusively from natural organic ingredients which makes it quite safe to use. I have been using CBD Oil for some time now and I am confident enough to say that I have seen immune system improve significantly. I am able to deal with stress more effectively as well as having healthy energy and stamina in my daily activities. For those looking for anti-oxidants or want to improve their focus and memory, this organic oil is the perfect gift for you. I applaud HoneyColony for making this wonderful oil product for nourishing the body. This is the first bottle of CBD hemp oil I ever purchased after hearing about the health benefits of it on tv. The taste is ok, I like the overall well-being that I feel when using it daily as everything about my health has improved.I definitely recommend this hemp oil from Honey Colony. I got this product as part of a network to review and it’s for sure a product of trail and error and what works for you. I tried several things to make this product for me, like upping the amount of drops I take at a time but at the end of the day the easy best way for me to consume this was to vape it. I would recommend this product for sure. I am impressed. After using Superior for about a week I noticed I did feel more balanced. I usually hit a slump in the afternoon from 2 o‚Äôclock to 5 o‚Äôclock. It is during this time period that I feel exhausted and unable to concentrate. I‚Äôve noticed lately that I feel more relaxed, calmer, and more focused. I still have a slump in the afternoon but it is not as bad since I started taking Superior Oil. I would recommend it to anyone who has fibromyalgia or other related conditions. This is a great addition to my natural pain relievers. It has brought down my pain levels and helped me to relax and feel calmer. Will definitely recommend this to any one with a chronic pain condition. Agree with the other reviews that the taste is not unpleasant but rather soothing. You can definitely tell the formulation is prime, as I have never experienced a plant based water soluble oil, as smooth and pleasant as Superior. No harsh plant taste. No alcohol. No chunks of non-synthesized ingredients. Just a hint of orange, actually. Never seen such an advanced line up of ingredients to compliment the medicinal extract. Experienced a subtle feeling of relaxation in the eyes and shoulders with a slightly uplifted attitude toward the day. This brand is amazing and the value is great. I use this oil to give boost to my health and reduce the stress level. Well worth the investment and I feel very comfortable using this CBD oil because I know I can trust the quality behind the label. Delivery was fast, packaging awesome!, smells fresh and tastes great!!! Thanks. This product has been working like a charm for me on pains. I am so happy to have found something that helps to relieve pain, help me sleep, & relax me without side effects. Also good for your skin with added health benefits! Thank you, Honey Colony! I have come to love this product so much! The taste itself isn’t too strong, and is actually rather enjoyable, meaning I am always looking forward to my next dose. I have found that it calms me down immensely, and has generally reduced my stress levels, exactly as described. I would happily recommend this to anybody, this oil is priceless! I just opened my bottle and it looks and tastes completely different than before. The color is much darker and the taste it a bit bitter. Why is this? It’s very possible to get two get bottles from two different batches in new order. There will always be some taste variation with the botanical extract because these are whole plant extracts and carry the natural constituent profile which of course has naturally occurring variation. In regard to the color, minor variation will occur with each batch. Is Superior CBD oil considered an isolate or full spectrum? The statement “full spectrum” is inaccurate, actually. But common parlance uses that phrase to describe the whole extract as opposed to the isolated CBD compound. We absolutely use whole plant oil, CO2 extracted, which contains additional minor cannabinoids and terpenes. Isolate is cheap, easy to work with, and it’s impossible to track sourcing. It lacks the synergistic qualities of the “entourage effect”- a recent term used to describe the beneficial composition of whole plant extractions. We further encapsulate our extract in a natural phospholipid, for premium bio-availability, avoiding the degradation of hepatic first-pass metabolism. Decarboxylation is a chemical reaction that removes a carboxyl group and releases carbon dioxide. The two main catalysts for the process are heat and time. So, when we subject CBD-A to heat, this decarboxylation process converts it to CBD. While CBD-A has desirable characteristics, the weighty and well-researched qualities of CBD are the most highly saught and we use CBD in our formula. It’s a full spectrum extract so does include other minor cannabinoids and terpenes, but the CBD-A in our extract oil has been converted to CBD through the application of heat. Do you ship CBD oil to Canada? Please read this page for detailed information. Do you ship Hemp to Canada? How many milligrams of CBD do you recommend for chronic pain like neuropathy? Please be aware that we are not doctors and the best treatment is from a functional medicine point of view. However, our recommendation is to begin with a priming dose of 3 drops 3 times daily. The body seems to need a few days to warm up to the nutrient. Then, go to 12 drops daily, divided into 4 doses. Expect to see improvement incrementally and raise the dose if needed. There are different neuropathies and the various herbs in Superior are supportive and complete the formulation matters. There are currently no terpenes in the original hemp concentrate. Hemp contains few terpenes, which are present in certain hemp strains bred for high psychoactive properties. It is not legal to extract these terpenes for use in any products other than those regulated for seed-to-sale in legal states. Our partner company is currently working on the formulation of a hemp oil formula including naturally occurring terpenes. Stay tuned. Have you heard of CHS Cannabinoid Hyperemesis Syndrome? The only cure is to stop marijuana completely. Can CBD oil with .3% TCH trigger an episode? Little is known of the mechanism of action. Essentially, it appears that it develops only in those with a history of chronic use of very high THC strains and dabbing, which is potentially problematic in terms of memory and brain function as well as causing CHS in some people. In regard to CBD: it’s a THC antagonist, which is why MJ deliberately bred strains that raised THC while lowering CBD. It’s not the balance that nature provides in the cannabis plant, and as usual, the interference of the human interest in the high changed the plant to create issues. Silly humans. Our formulator Elizabeth Moriarty’s position that full spectrum CBD can assist in recovering a balance in the endocannabinoid system in the presence of chronic use of high THC. CBD can be an important aspect of a treatment protocol for CHS. Most work-place drug screens and tests target delta9-tetrahydrocannabinol and do not detect the presence of phytocannabinoid diols or other legal natural hemp based constituents. However, studies have shown that eating hemp foods and oils can cause confirmed positive results when screening urine and blood specimens. If you are subject to any form of drug testing or screening, we recommend (as does the United States Armed Services) that you DO NOT ingest this product. Prior to consuming these products consult with your healthcare practitioner, drug screening\testing company or employer.